In my new book, What the Dead Have Taught Me About Living Well, I have opened up and shared the details of my personal life. I walk readers through a day in my life to see how I tune in to see, hear, and feel the presence of spirits to help support and guide my decisions and actions. Throughout the book, I have included sections called “How I Use This in My Life” which are specific examples of how I use insights and guidance from beyond to help transition from feeling stuck, unclear, and perhaps hopeless, to feeling more clear and empowered. Today I want to share one such section, which accompanies a chapter about abundance. It may not be the currency of the spirit world, but it cannot be entirely ignored while we reside on Earth. So, how can you experience the financial abundance you need, want and deserve in your lifetime? As you integrate any or all of the affirmations below into your daily meditation you will begin to shift your mindset from lack of towards abundance. I release my fear of not having enough money. I am not defined by my bank account. I let go of any tendency to label money as bad or evil. I separate any past negative financial situation from my present experience. I let go of any conscious or unconscious fear, worry, guilt, or anxiety around money and financial security. The key to shifting your subconscious mind is to replace your negative beliefs and attitudes with repeated use of new positive affirmations. With dedicated repetition, these affirmations will empower you to a new way of thinking that will shift the amount of abundance you receive. I can depend on myself. I am worthy of having my needs met and provided for at every moment. I am responsible with money and choose to spend it wisely. I see money as an exchange of energy. As I do what I love, plenty of money easily follows. 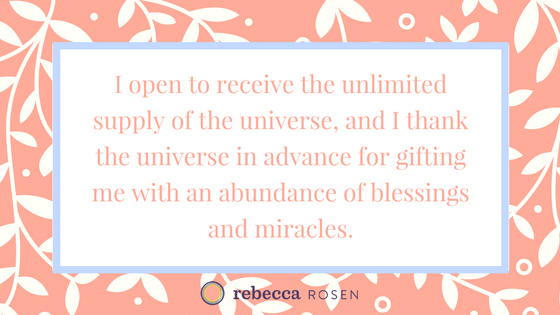 I open to receive the unlimited supply of the universe, and I thank the universe in advance for gifting me with an abundance of blessings and miracles. Abundance takes many different forms and I am open to all creative solutions. I prosper when my thoughts are rich with positive expectation. How does this resonate with you? How do you feel while you say these affirmations? Is abundance an area that you struggle with, whether it’s with manifesting or accepting abundance? Please share your thoughts in the comments section.